Introduction: The ideal procedure for the treatment of morbid obesity should be safe across a broad range of patients with equivalent weight loss results as the current standard, the Laparoscopic Roux-en-Y Gastric Bypass (LGB). Since its introduction, the Laparoscopic Vertical Sleeve Gastrectomy (LVG) has increased in popularity for the primary treatment of morbid obesity. The benefits of the LVG include a low complication rate, the avoidance of foreign material, maintenance of normal gastro-intestinal continuity, the absence of malabsorption and the ability to convert to multiple other operations for weight loss failure or recidivism. We reviewed our experience with both the LGB and LVG for patients with a BMI < 50. 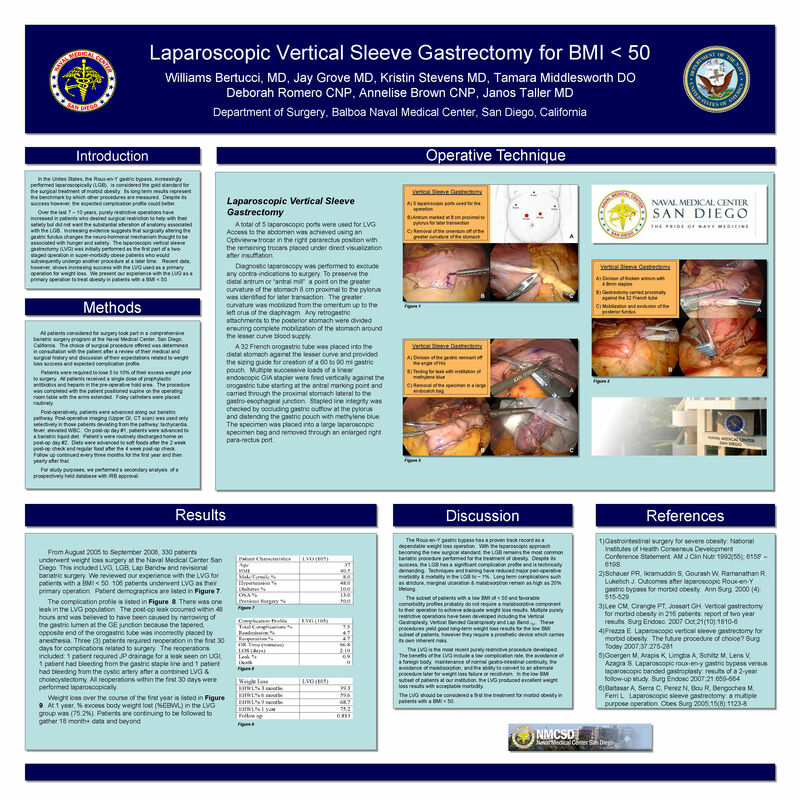 Methods: In August of 2005, a comprehensive bariatric surgery program was established at Naval Medical Center San Diego. LGB and LVG were both offered as primary treatment of morbid obesity. LGB was performed in an antecolic, antegastric fashion with a lesser curve based, rectangular gastric pouch. LVG was performed through linear stapling of the gastric fundus along a 32Fr orogastric tube placed against the lesser curve. We performed a prospective secondary analysis of an existing database with IRB approval. Results: There were no statistical differences in preoperative patient characteristics or postoperative weight loss results. The only significant differences were the decreased operative time and length of stay in favor of LVG. Conclusion: LVG is the new procedure of choice for the treatment of morbid obesity with a BMI < 50.